LEXINGTON, Ky. — A colt by War Front from the family of Hall of Famer Rags to Riches became the most expensive Thoroughbred yearling to sell anywhere in the world to date this year when he commanded $2.4 million from Coolmore’s M.V. Magnier during Tuesday’s second session of the Keeneland September Yearling Sale. 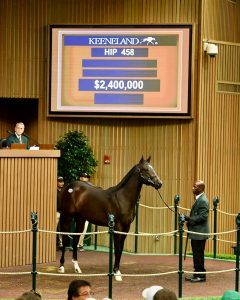 War Front also sired the day’s top-priced filly, a half-sister to champion and Kentucky Derby (G1) winner Nyquist, sold for $1.75 million, and a colt from the family of Irish highweights Yesterday (IRE) and Quarter Moon (IRE) for $1.2 million.